Posted March 18th, 2019 . 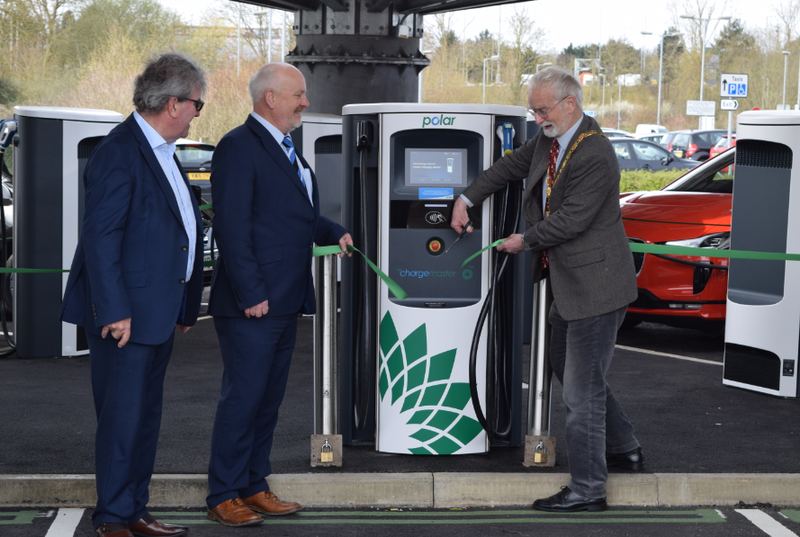 The country’s largest universal rapid charging hub for electric vehicles has been inaugurated by Milton Keynes Council and BP Chargemaster. The hub is operating on Polar, the largest public charging network in the UK, and is located within a minute’s drive of the M1, just off junction 14 at Milton Keynes Coachway. Milton Keynes Council, with its contractors Ringway designed and constructed the hub as part of its Go Ultra Low City programme. Funding for the project came from the Office for Low Emission Vehicles (OLEV), as part of a £9m investment package to support the growth of electric vehicles in Milton Keynes. It incorporates three highly-visible canopies to help drivers locate the rapid chargers, as well as to shelter them from inclement weather, and provides access to the facilities at the main Coachway building, including a café for drivers to grab a drink and something to eat while they are charging.